The primary goal of Reading Workshop is to help children fall in love with words, books, and reading! You can create the conditions for this through both your physical environment and your classroom culture. When you teach explicit lessons around independence, risk-taking, engagement, and the joy of reading all of the children become part of a literacy-rich community. Help children see themselves as part of a group of readers who get lost in books and look forward to talking and writing about them and learning from them. Create an inviting and supportive physical environment that will give the readers in your room choices in where to sit, what to read, and how to respond to their books. 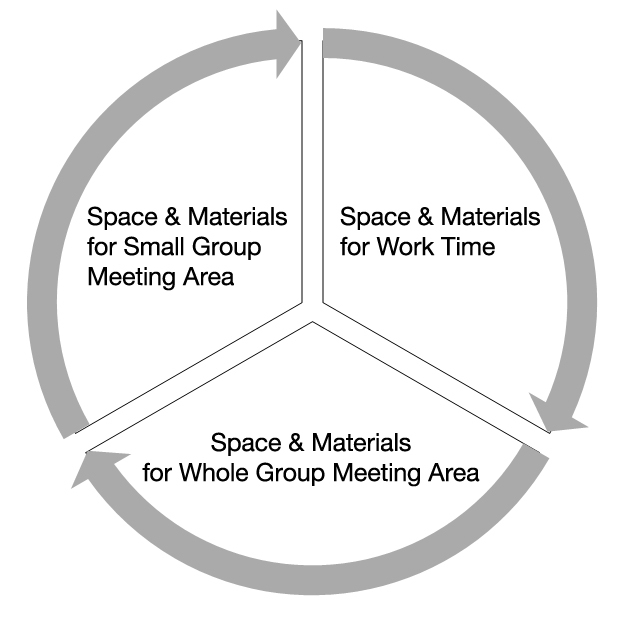 Consider the spaces both you and your children need to work individually and in groups. 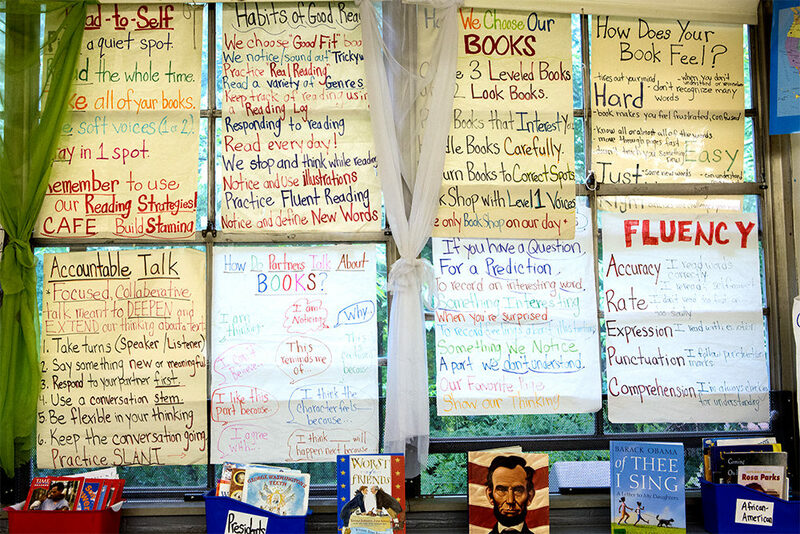 Consider the materials your community needs such as books and both visual and language-based anchor charts. These elements will work in tandem to support your children’s independence and growth as readers. For Reading Workshop to be most successful, help children learn what being part of a literary reading community means. During workshop, each child will have individual responsibilities during whole group lessons, small group work and as an independent readers. In order to develop these classroom practices you will want to consider the following questions. What does it look like when a reader comes to the rug? What does it sound like when a reader reads independently? What does it feel like to find a just right book? How do I keep myself focused on reading? 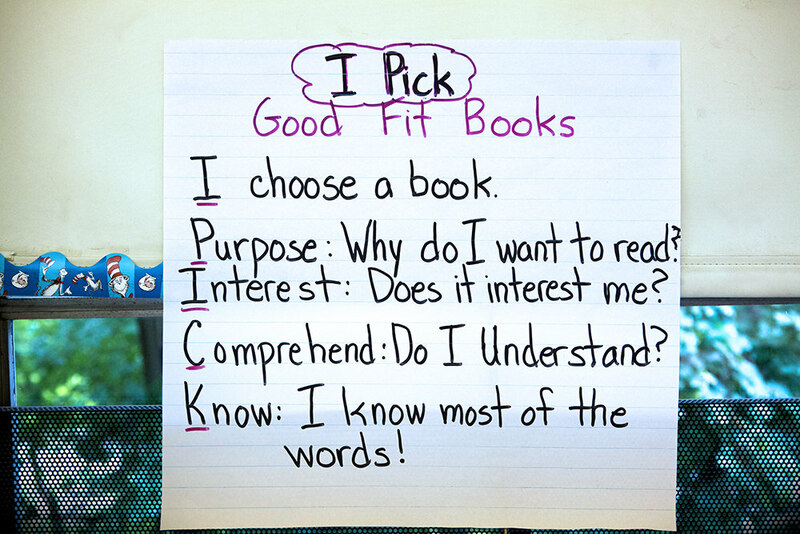 These questions and more should be explored during explicit Reading Workshop lessons. Procedures that you plan and model, give the children practice with, and then reflect upon will be the ones that are most effective. The following is a sample of ideas you can teach that will support your children’s growth as they navigate the routines of Reading Workshop. Observe your own class of children to see specifically what they need to be successful during Readering Workshop in order to create a literary classroom community. In the book Self-Directed Writers, Leah Mermelstein describes the qualities of independent, self-directed learners. While her focus is on writing, the same qualities should be evident in readers who are part of a thriving Reading Workshop. These are qualities that may come more naturally to some children than others. However, in order to create a healthy culture in which all readers learn, talk about, practice and reflect on these traits, you should teach explicit lessons around them. Help children recognize these qualities in themselves and others. Help children grow their self-directed learning skills so they too can become independent readers. Here are some traits and lessons that would support their growth. Readers, sometimes you may complete a book while it’s still reading time, and you may not be sure what to do next. Today, let’s talk about some of the things you can do when you finish reading one book so you can be sure to use your time well. Readers, so many of you know the types of books that you enjoy reading. I know Marissa loves reading Big Nate books and Stephanie loves reading mysteries. Today, I want to talk to you about trying out a new type of book. I’d like you to make a plan to select a book that is unlike any other book you have ever read before. Doing this might help you discover a new author or book or series! Readers, I know how much you love Reading Workshop and I know that sometimes when I say that reading time is coming to an end, you might feel disappointed. So today, I would like to talk to you about a new signal I am going to use that will alert you to when there are five minutes left. This signal will help you find a good stopping place in your book. Readers are actively thinking while they read, using resources in the text and their own skills and strategies to make sense of their books. Readers feel comfortable discussing strategies and teaching classmates about a strategy they used during Reading Workshop. Readers, just the other day I was reading when something strange happened. While I was reading, I started to think about the shopping list I needed to make and I became distracted. Thumbs up if your mind has ever wandered while reading. Today, I am going to teach you how to catch yourself when your mind wanders and how to re-focus on your book. 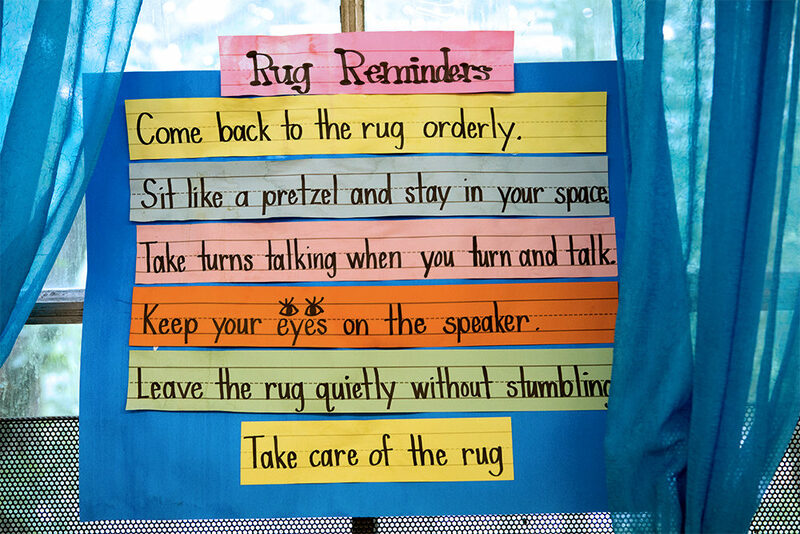 Creating an inviting and useful physical environment will provide the readers in your room with the support they need to be independent, resourceful, and productive during Reading Workshop. 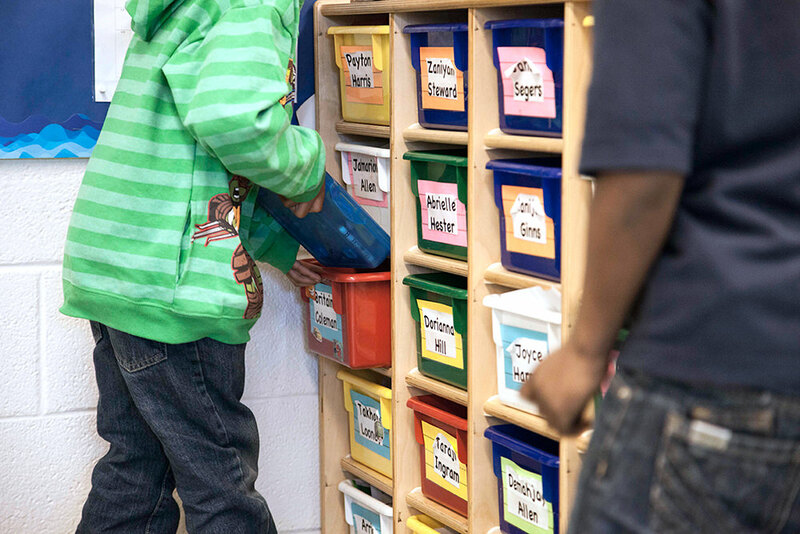 When planning your literacy environment, consider the variety of ways children might use the spaces and materials in the room and the variety of ways you will be meeting with them. shelves for storing teaching materials like dry erase markers, index cards, etc. The classroom library should be a special place in your classroom to highlight the importance of reading, books, and literacy in school. The library corner is where quality children’s literature is organized, categorized, and displayed and where the leveled library is housed. The classroom library can be filled with inviting items such as lamps and plants and can include cozy spaces where children can read alone or together. 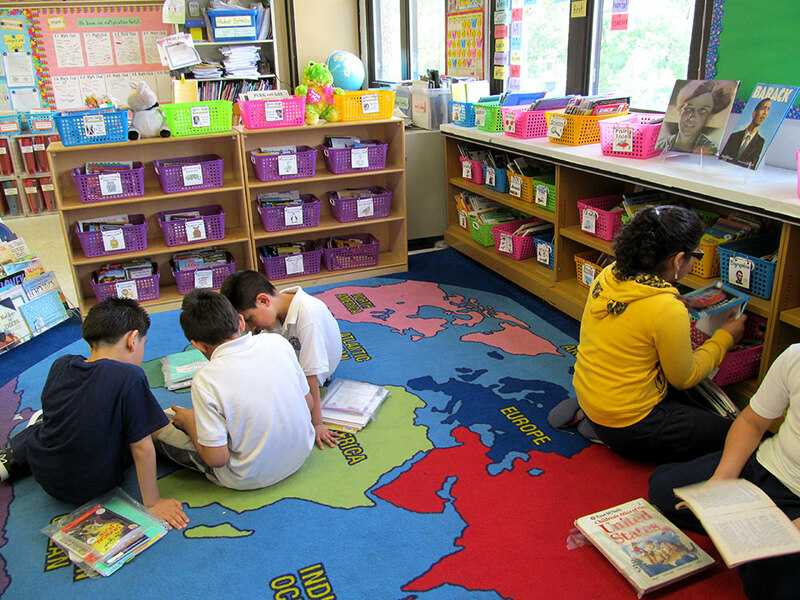 In a small classroom, the library corner is often combined with the large group space. Choose a quiet space away from the busier traffic flow areas. Make the library inviting. For example, use bean bags, couches, chairs, low tables, pillows, lamps, plants, framed pictures of children reading or favorite book covers, and stuffed animals to create a comfortable environment. Sort your books by theme, genre, author, and level. Include books that reflect children’s home languages and cultures. Label shelves and/or book baskets by genre (such as fiction, poetry, etc.). Use picture icons when possible. Display many of your books so the covers are facing out, to capture your children’s attention. Leveled books promote high success reading opportunities for all children by giving them the opportunity to read books at their independent reading level. Books are considered at children’s independent level if they can read the text with 95% accuracy (i.e., no more than one error per 20 words read.) Books at a child’s independent reading level are relatively easy text for them. In most classrooms, it is recommended that at least 1/3 of the library be leveled. Children often begin their search for their just right books by browsing the basket that matches their independent reading level. Use this correlation chart to create leveled books for your library. If your books are not part of an easily identifiable pre-leveled series, they can be leveled in accordance with one of the many systems that exist. Use the leveling system that is already in place in your school and code your books accordingly. If there isn’t one, then try the Fountas and Pinnell’s Guided Reading alphabetic levels (A-Z) which is arguably and currently the most popular leveling system. Consider what levels would be appropriate for the readers in your room. Use a correlation chart to guide your decision making. For example, a typical 1st Grade leveled library may include books between Fountas and Pinnell levels A and M.
The free Book Wizard app from Scholastic allows you to type in the name of a title, author, or keyword associated with a book and find the level or scan the barcode of the book. Not all books are in their database, but once a book is located you can view a synopsis of the book and basic information including the level. This app also allows users to create an inventory of all titles in classroom library. Level It is a paid app available for iPhone and Android users. It has the same manual search features as Book Wizard, and the levels displayed are easy to see. This app also includes features to inventory your classroom library, create individual child profiles, and check books in or out to specific children. The Literacy Leveler App by FikesFarm, LLC is another paid app similar to the Level It app, but currently only available for iPhone users. It allows users to manually search by title, author, or ISBN; as well as scan each book’s bar code. It also allows you see a list of all books in their classroom library list at a given reading level. Another free app for iPhone and Android users is the Classroom Organizer app from Booksource. The app can also determine reading levels and organize and track books in the classroom library. The Leveled Books Database at A to Z Teacher Stuff allows users to search by title or author to determine the reading level for children’s books. You have the option of searching to find Guided Reading Level or Reading Recovery Level. The Scholastic Book Wizard is also available through a free website. Here you can view a book’s Grade Level Equivalent, Guided Reading Level, or Lexile Measure. The Leveled Book website from Fountas & Pinnell is available as a subscription service. $25 for an annual membership, group discounts are also available. This is Accelerated Readers (A.R.) free source for leveling books. Once you go to the site, go to the “store” button and you can search for books by title or author. When leveling your library, pay special attention to the needs of your ELL children. It can be challenging to find books at the appropriate English reading level that is also age appropriate in terms of content and structure. For example, a third grade ELL child may be at a C reading level; however, the content and structure of a C book may not relate to the child’s interest. Consider adding readable materials for your ELLs that include supportive structures such as current event series, comic books, and/or graphic novels. Another possibility is to add audio books. Audio books are engaging and expose ELL children to fluent readers of English. It’s important that children spend time reading books that they can decode with a large degree of accuracy. This is especially true for emergent readers, early readers, and English Language Learners who need a great deal of practice developing their print skills. It is suggested that emergent and early readers read about 10 books each week (rereading them often to strengthen their decoding skills and fluency). Transitional and fluent readers, who don’t tend to re-read the same book but benefit from reading books in the same series, read anywhere from two to 10 books depending on their level. To support children in this work, your library will have to contain a large number of books, in a wide range of topics and genres that are both decodable and interesting for your readers. The books in your library should both mirror the children’s lives, interests, and home languages and also be a window into other worlds and topics. But what if you need more books? In order to build a rich classroom library, sometimes you have to be resourceful! Below are some suggestions for ways you can stock your library with books your children need and will enjoy. Book club points: Scholastic book clubs, etc. During work time, children spend a great deal of time reading what is commonly called “just right” books. Just right books are books that children can read accurately and fluently. They are books that children comprehend and books that are of interest to them. When they read books that fit these characteristics, children have the opportunity to “integrate complex skills and strategies into an automatic, independent reading process.” (Allington, 2002) Therefore time spent reading just right books helps children become independent readers. Remember, what children consider just right books for themselves should evolve as the year goes on and their reading identities evolve. Text should get more complex, general interests may change, and new genres should be explored. During Reading Workshop, children need to have “book baggies” or boxes that are filled with the books that are “just right” for them. Often, selecting books for their book baggies can be somewhat of a time consuming process. After all, you want children to take their time. You want them to explore your library’s collection which should change as the year and your curriculum changes. Research has shown that a large, varied, and often-refreshed collection of books in the classroom is a vital ingredient in improving reading performance (Susan Neuman, 1999). You want your children to make smart choices that show they are becoming more knowledgeable about selecting books that are a good fit for them and that allow them to explore and expand their interests. Research has also demonstrated that access to self-selected books improves children’s reading performance (Krashen, 2011). Strategies on how to organize book shopping for your children to prepare them for Reading Workshop. Because time spent reading is so precious, find time for children to shop for books that doesn’t overlap with actual time set aside for reading. When reading time occurs, you want the children to already have all their supplies with them and be ready to go! Also, your classroom library may not be sizable enough for all children to select books at the same time. Try dividing your children into five groups. Assign each group one day (Monday, Tuesday, Wednesday, Thursday, and Friday) each week that they may shop for books. Use a transition time such as first thing in the morning or at the end of the day for children to shop. If you run centers in your room, consider making “Book Browsing” a center so children can book shop during that time as well. You’ll need to be flexible with whatever system you choose. If Monday is a holiday allow that group to shop first thing Tuesday morning. If children are absent, let them go on the day they return. If a child struggles with book selection, you might want to spend time with that child during work time to review strategies for selecting books. Emergent and early readers: it is important for them to reread their books to develop sight word automaticity and fluency; they should have approximately eight to 12 books in their bags. Transitional and fluent readers: these readers are generally moving into longer chapter books and generally do not reread. They might have approximately three to seven books in their bags. Teach procedural mini-lessons that help children know where to store their book baggies, how to keep them up to date and what to do when materials in the bag need replenishing. Addressing each of these procedural elements of the book baggy tool will ensure that it remains a great resource for your children throughout the year.